My goal is to attune the canvas to my spirit by creating a tension between the colors, a chemistry between light and dark and by using the force of the composition itself. Painting one’s feelings or one’s sense of self is never easy, but it is the only way I know to try to communicate with kindred spirits. I’m striving to let the colors sing the tune to which my soul moves and convey my passion for the beauty of living. 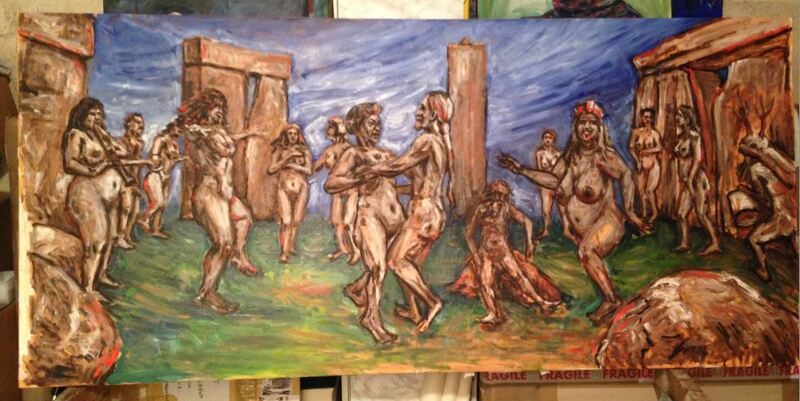 In this composition I’ve used the stones of the henge to portray the womb of Mother Earth in which primordial woman is dancing, surrounded by her kin. She breathes to the rhythm of the living rock, the rock that is conscious of eternity and amused at the ephemeral grace of those magical beings twisting to the music of the rapidly changing tides. The old man, after finally having spent his tiresome ego, is awed by the perpetual creative power of her femininity which only gains in beauty with each progressive phase and is astounded by the simplicity of it all, of living for the sake of loving. This entry was posted in Spiritualistic and tagged paga, painting, Painting "Samhain Celebration":. Bookmark the permalink.